When we met Austin’s ‘taco mafia’ for lunch and tried the excellent tacos al pastor straight from the spit at the humble Rosita’s Al Pastor, I knew this was a dish worthy of further exploration. And that I had to develop my own tacos al pastor recipe. The simplicity of corn tortillas topped with pork, marinated with pineapple, spices and chilis, grilled on a vertical spit, and sprinkled with cilantro (coriander), and those beautiful Mexican white onions, reminded me of the Middle East’s wonderful snack food, the shawarma – well, apart from the use of pork! After eating tacos al pastor in their birthplace, Mexico City, way back on our first trip there in the early 1990s, and trying them again for the first time in years on our recent street food tour with Lesley Tellez of Eat Mexico, I knew I had to test out whether you could make them at home and give them the same flavour, if not repeating the singular experience of eating good tacos on the streets of Mexico City. Our favourite taco place, Salón Corona, a couple of blocks from our holiday rental apartment in Mexico City, drove me to the point of obsession. The spit at our local favourite in Mexico City, Salón Corona. A great spit at a street stall in Mexico City. A delicious version with lots of pineapple. Yet another version with a slice of pineapple and onions on the side – delicious. One of my attempts – starting with a lovely pork loin. 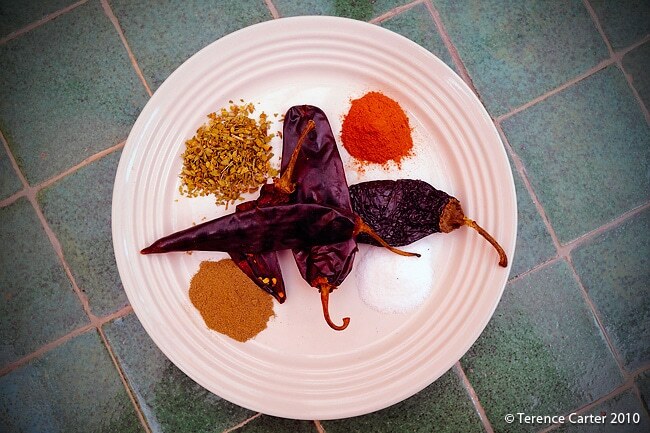 The mix of spices and chilis for the marinade. The chilis rehydrated, chopped and ready to add that smoky flavour to the pork. The mix ready for the fridge. Marinate at least overnight. There are (perhaps surprisingly to those who don’t know much about Arab immigration history) over a million Arabs living in Mexico. 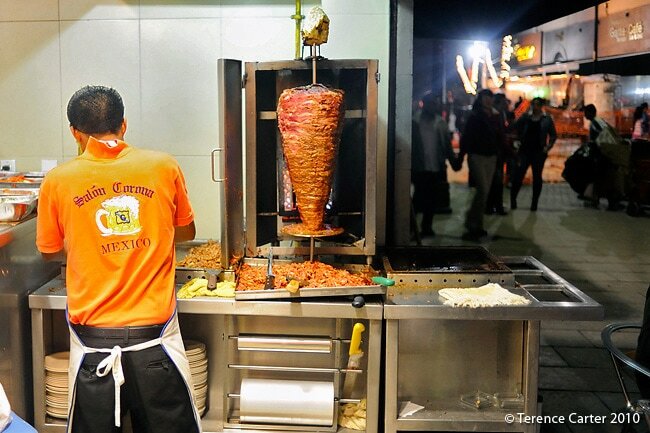 It was Syrian and Lebanese families who brought the vertical spit to Mexico, which they used to make shawarma in Mexico in the 1920s and the rest is history. I’m not sure how or why we didn’t notice the shawarma-style spits serving up tacos al pastor when we were in Mexico for the first time 17 years ago. We certainly knew and had eaten shawarma a lot in Sydney, where one of our friends owned a Lebanese restaurant. 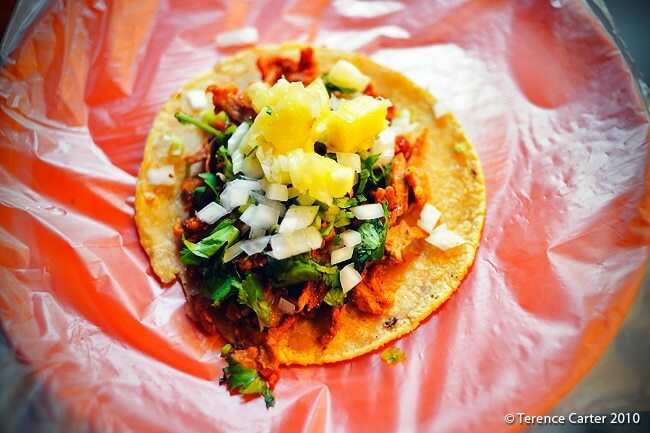 We certainly noticed it this time and made a point of trying tacos al pastor at every opportunity. And we enjoyed every mouthful of every one we ate. But is it possible to make a version at home in other parts of the world where Mexican food generally equates to a ghastly chain restaurant that serves Tex-Mex burritos and indescribable enchiladas with lashings of horrid, bright orange cheese? I have to admit it would be difficult. One of the keys to making this sublime snack is the chilis. You don’t want them, you need them. Given that this is a dish I was now determined to make, I set about doing lots of eating research, I studied recipes, and I asked around. Everyone agrees that the meat needs to be grilled on a vertical spit with the pineapple skewered on top so the juice drips through the meat. But I wasn’t deterred! I tried a pre-prepared al pastor mix. I tried marinating a pork loin and other cuts for 48hrs. I sliced the pork thinly as if it was going on a vertical spit. I grilled it. I roasted it. I also cooked it in a crock pot on the stove. With Lara — who had become just as obsessed with eating it as I had making it — also taste testing, our verdict for a tacos al pastor recipe that doesn’t require a vertical spit is now in. 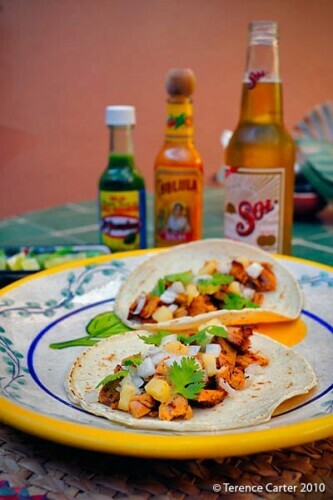 The recipe below gave us the most authentic-tasting tacos al pastor I could come up with. Was it as good as some of the fantastic ones we tried? It was very close. Is there any way you can substitute flour tortillas for corn? Absolutely not. Is there anything as good as having some after a few drinks in Mexico City? Not a chance! But still, here it is. Sure the Taco Mafia in Austin will probably order a hit on me for creating a recipe that doesn’t use a vertical spit, but, hey, I’ll just send around one of my new wrestler friends! One final note: some recipes use vinegar. We don’t need no stinking vinegar. There is enough acid from the pineapple, thanks. Traditionally the pork for these tortillas is slow-cooked on a vertical spit, but this version is created with the home cook in mind. Slice the pork loin thinly, diagonally across the loin. We’re talking 3–5mm slices. The dried chilis need to be rehydrated in water: pour hot water over the chilis, but take them off the heat immediately. Snip the chilis with a pair of scissors to allow water into the chili and to allow the whole chilis to be covered in water. 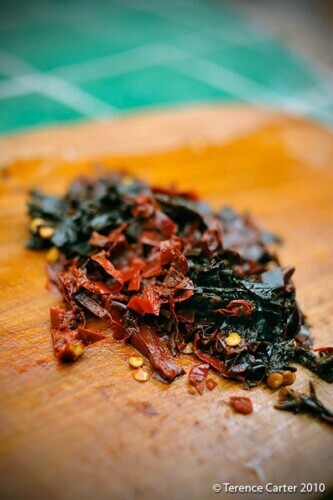 Remove the membranes and seeds from the chilis and slice the chilis. After step 3, gentlemen in particular, wash your hands thoroughly. Don’t make me explain. Throw all the ingredients into a blender, but not the pork, obviously. 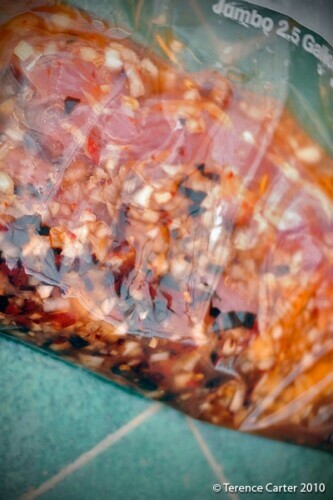 When the above ingredients have formed a nice smooth-ish marinade, place the pork slices in a large plastic freezer bag and pour the paste over. Combine thoroughly. Marinate in the refrigerator for at least 8hrs, but 24hrs is more desirable. Pre-heat the oven to a moderate temperature, say 350˚F or about 185˚C. 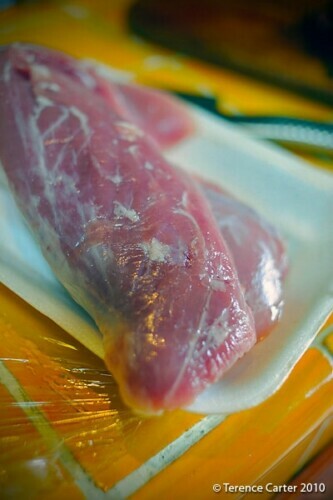 Take the pieces of pork out of the freezer bag and form into a ‘roll’ shape on a piece of aluminum foil; add plenty of the marinade before folding over and making the ‘round’ shape. Place the pork in the oven and prepare for some beautiful aromas. It should take around an hour to cook. The temperature (which should be measured with a meat thermometer) should be around 160˚F or 72˚C. For those paranoid about ‘pink’ meat, don’t despair, you can finish the pork in a grill pan to your heart’s content – which is what we’re about to do. Put a grill pan on the stovetop at a medium-high heat. Add some cooking oil (no, not olive oil), and add some pieces of the pork, and cook to your liking. To achieve the kind of texture that you get from the vertical spit, you need some pieces to have a little crunch. Place some corn tortillas in a pan to heat through. Place a small amount of pork on each tortilla, add a sprinkle each of cilantro, onions and pineapple (if desired), and get everyone to add their own preferred salsa. Have a michelada or a good stiff shot of tequila and a cold beer on the side. 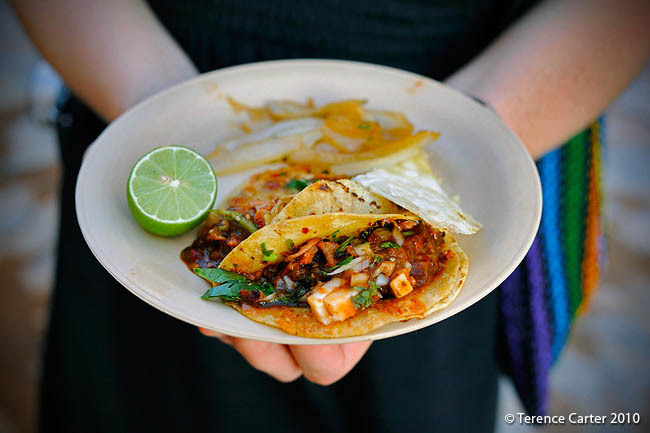 You could also serve with a margarita, but remember this is street food we’re celebrating! Cool! I’ll have to try this sometime. Only thing that confused me was forming the “roll” shape on the aluminum foil. What exactly do you mean? Do you have a picture you can share? 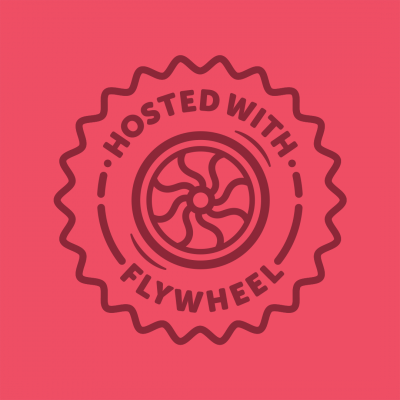 Really digging your site by the way! It’s great to hear about your classes and what you’re learning. Anna, you might be able to source achoite in Sydney. I think there was a place in Leichhardt that imported Mexican ingredients. Okay, I get it now — simulating the spit makes complete sense. I’d *love* to do the blowtorch thing if I had one. I might give this a shot in the next few weeks… I’ll report back and let you know how it turned out. What, no homemade torts to go with fresh al pastor??? Alright, we’ll give ya pass…this time! Did you take a tequilooche every 20 minutes? That helps the flavor flaves and it’ll get ya drunk! Great post guys! Ha, I had enough to do without making the damn tortillas! I made it three times – each time using three different methods! Glad you enjoyed the post and didn’t order a hit on me! You know every secret (and best) spot in Mexico! Even Salon Corona… I also love researching food. Thanks, haven’t revisited the recipe for a long time because I can’t get all the chillis here! Another recipe combined with a history lesson. So much better than a straight ‘recipe’ book. Great instructions on the roll shape too.